Addressing water damage doesn’t have to be a hassle for you and your business. KIWI Services offers affordable, efficient, and thorough commercial water damage restoration to all Austin businesses. If your business is in need of water damage restoration, then look no further than KIWI. • Immediately Extract All Standing Water KIWI knows how important it is to remove standing water from your business to minimize damage. We will move quickly to get your business dry again. • Restore all floors From carpet to tile, KIWI can work to restore your floors. We can also restore any rugs that may have been damaged. • Mold Removal and Prevention KIWI will work to remove all molds and mildew, as well as put in preventive measures to help stop mold from regrowing. • Thorough Drying We will go into cracks and crevices to remove all water. Any water that is not visible and can be damaging in the future will be taken care of thoroughly. KIWI wants to keep the cost low and your happiness high, which is why we will work with your insurance for all costs. We also provide a one-year guarantee for all water damage repair work done, as well as a One-Year Carpet Cleaning Warranty. KIWI Services’ Austin Water Damage restoration team is the best the city has to offer. 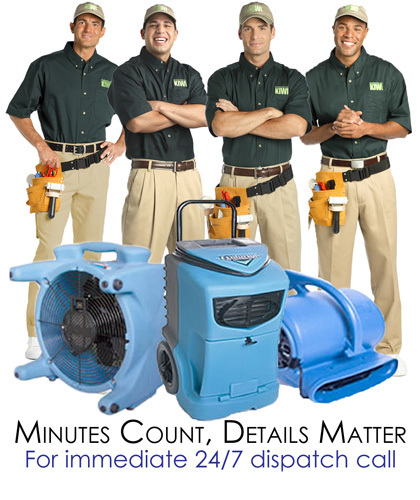 Our team is so dedicated to your needs that we provide 24/7 Emergency water damage repair and restoration. If a busted water pipe strikes at 4 in the morning, Kiwi’s team is available to you right then and there. Do not hesitate in contacting us. If your business has suffered from any kind of water damage, contact us immediately. We will send help as soon as you call and not a second later. Your business is our first priority.